If you enter your Facebook credentials in Settings, your Facebook friends — and their phone numbers, if they were made publicly available in Facebook — will automatically populate your list of contacts. You can also add your Twitter credentials to populate the list with Twitter usernames and photos. Think of the payout on a One-Armed Bandit with that kind of power. Moving your fingers along the alphabet on the right edge of the Contacts list. You can also tap one of the letters to jump to names that begin with that letter, easier said than done with the tiny size of those letters on older phones but a bit simpler on the larger display models. Starting to type in the search field near the top of the list. Try the name of the contact or the place where your contact works. When you’re at or near the appropriate contact name, stop the scrolling by tapping the screen. Note that when you tap to stop the scrolling, that tap doesn’t select an item in the list. This behavior may seem counterintuitive the first few times you try it, but you may like it once you get used to it. Tap the name of the person you want to call. You see a lot of fields with the individual’s phone numbers, physical and email addresses, and possibly even a mug shot. You may have to scroll down to see more contact info. If the person has more than one phone number, the hardest decision you must make is choosing which number to call. Tap the phone number or the circled icon with the phone icon visible and the iPhone initiates the call. Your iPhone contacts reflect any groups you belong to, such as different departments in your company, friends from work, and friends from school. When you’re looking at the Contacts entry for an individual person, a Contacts button appears in the upper-left corner. Tap Contacts to display the roster of all your contacts, and the button at the upper-left corner changes to Groups. Tap that button to access contacts for a given group. Among the Group listings you see is one for all your iCloud contacts and one for all your friends on Facebook. In some cases, your contacts will be linked — that is, information supplied by Facebook, Microsoft Exchange, or some other source will be combined into a single entry. An obvious benefit of this linking is that you can cut down on duplicate contact listings. If the iPhone doesn’t automatically link appropriate contact entries, you can do the job manually from the given contact. Tap Edit, scroll to the bottom, and tap the green circle with the white + inside to link contacts. Choose the appropriate entry to link with from among your entire list of contacts. Your own iPhone phone number, lest you forget it, appears at the top of the Contacts list, provided you arrived in Contacts through the Phone app. 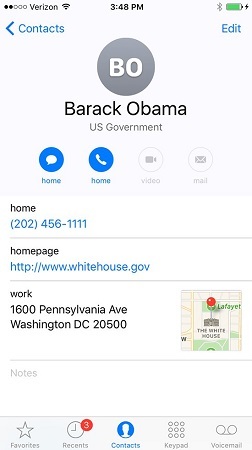 Tapping Edit in a specific contact lets you add all sorts of additional information for that person, including addresses (with a thumbnail map), birthdate, and social profiles. You can also initiate text messages and emails from within Contacts. If you have the iPhone 6s, 6s Plus, SE, 7 or 7 Plus, you can press down on a contact to seek additional ways to connect. Yep, you’re exploiting 3D Touch. With the arrival of iOS 10, third-party apps got the green light to integrate their information with your iPhone contacts.